Categories Consulting, Hit or Miss? On the RSS feeds that show atop my Gmail inbox I sometimes see a ridiculously priced HDTV or MacBook at an auction. Instinctively I dismiss the link as a scam. However, out of idle curiosity I decided to take a look at one such link today and I came across a really interesting business model. 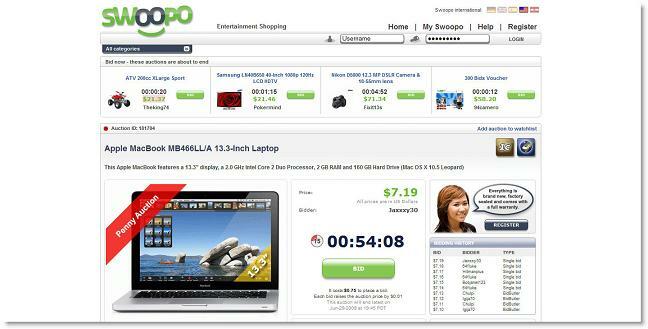 Swoopo operates very differently from a traditional auction site like eBay. In eBay you can buy or sell stuff. When you buy there is no cost involved in the bidding process. If you are eventually the highest bidder for an item you win it. You pay the seller the amount the bid was settled for. eBay makes money for each listing and takes a small percentage of the selling price. If something was not sold, eBay still gets the listing fee. Swoopo is different. For starters you cannot sell stuff (if you can, I couldn’t locate it on their site). Secondly, you cannot buy using the traditional methods. Who in their right mind would sell a MacBook for around $7.00? But there is a lot more to this than meets the eye. In Swoopo you actually pay to bid, so the cost of the item is divided amongst all the people making the bid!! Look at their Penny Auctions. The price of an item increases by 1 cent for each bid, however to bid you have to pay 75 cents each time. So if a $1,299.00 MacBook is eventually sold for $24.00, there have actually been 2400 bids on it @ 75 cents each. So Swoopo has actually made $1,800.00 in the bids alone, in addition to the minuscule $24.00 that the item actually sold for – that is a neat profit of $525 for the seller. And the best part is that even if the winning bidder has made 200 bids, he has only paid $174.00 for the item – a significant markup from the selling price of $24.00, though still way below the retail price of $1,299. So what’s the catch? The rest of the price is actually being footed by the losing bidders. So unless you are absolutely sure that you want to buy something and are willing to go for the kill in bidding, stay away!! The thing about Swoopo is that everytime there is a bid it raises the auction time by some seconds. So you could potentially be stuck in a bidding war and end up making a big enough loss in an attempt to outbid someone.